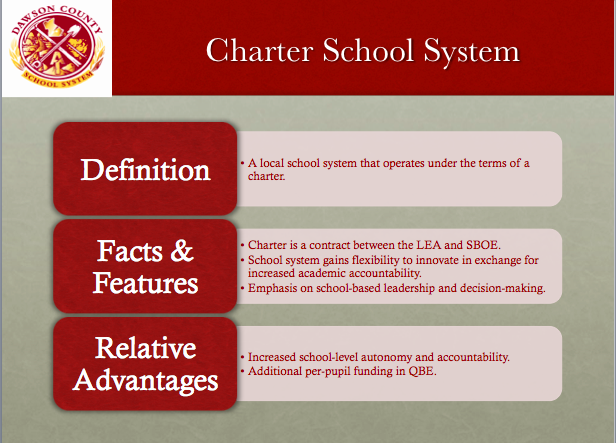 WHAT IS A CHARTER SCHOOL SYSTEM? A charter school system is a local school district that operates under the terms of a charter contract between the State Board of Education and the local Board of Education. They system receives broad flexibility in the form of waivers of certain state laws, rules, and guidelines in exchange for greater accountability for increased student performance and an emphasis on school-based leadership and decision-making. View meeting dates, agendas, and minutes of each School's Governance Council by clicking on the links below. Dawson County School District became a charter system in 2010. The State Board grants this Charter to the Local Board to operate a Charter System for a 10-year term beginning on July 1, 2016 and expiring on June 30, 2026. As part of our effort to become a Charter System, Dawson County Schools is providing this information to keep you informed and seek your opinion.